Pedro Castillo outside Aberdeen Sheriff Court. 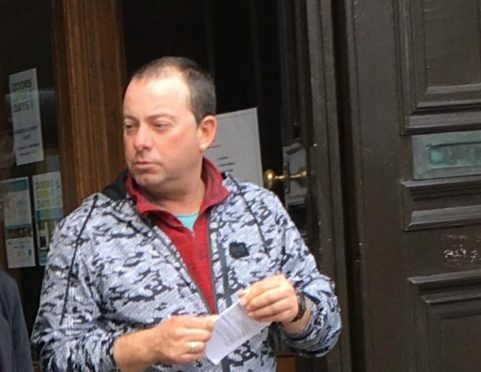 A pair of Spanish workers were caught drink-driving by police within moments of one another after getting behind the wheel following a night out in Aberdeen. Pedro Castillo and Alberto Riesgo are staying in the city while employed by a Spanish firm which has been contracted to carry out work in the area. Castillo, 43, and 40-year-old Riesgo had both gone out to celebrate the end of the working week when they found themselves in trouble last month. Fiscal Anna Chisholm said police watched as an intoxicated Riesgo entered his vehicle on Dee Street at 1.30am on Saturday August 18 and pounced as soon as he turned the key in the ignition. Riesgo, of Craigievar Crescent, was tested and found to have 37 micrograms of alcohol per 100 millilitres of breath. The legal limit is 22mcg. Castillo was apprehended shortly afterwards on Crown Street and was found to have 45 micrograms of alcohol per 100 millilitres of breath – more than double the legal limit. Defence agent Kevin Longino represented both men and explained that neither had intended to drink to excess on the night in question. Mr Longino described Castillo’s decision as “foolish”, but insisted that Riesgo had intended to wait in his vehicle for another colleague to drive him home. Sheriff Philip Mann fined Castillo £400 and Riesgo £380, because of his slightly lower reading. Each man was also banned from driving for a year.